Established by Joey Armstrong in 2016, Thunderhand Tattoo is located in Richland, WA Uptown Shopping Center. 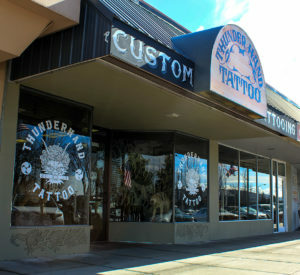 Thunderhand Tattoo’s main goal is to provide a welcoming environment where quality art can be created. by thunderhandtattoo Please visit our FB page to see Santana’s story and help if you can. Thank you everyone!! by thunderhandtattoo We’ve had such a great response from people wanting to get the valentines special next week we’ve decide to extend it for the full week Wednesday the 13th through to Saturday the 16th. If you would like to reserve a time we will be doing a deposit or your welcome to try for a walk-in on any of those days before 4:00pm. Have a great day everyone!! Valentines Tattoo Special $70-120 tattoos off featured flash sheet.